Observations of new comets are given in ICQ format. More recent ones may be available in TA format from the main page. Full details of recently discovered objects will not appear until they are available on the CBAT web pages, which is usually a fortnight after the publication of the IAUC. were discovered with the SOHO LASCO coronographs and have not been observed elsewhere. They were sungrazing comets of the Meyer group. For further information on the discovery of these objects see this year's SOHO discoveries. were discovered with the SOHO LASCO coronographs and have not been observed elsewhere. They were sungrazing comets of the Marsden group. Karl Battams has put together a probable family tree for the fragments. The orbital elements of C/2010 H3 are similar to those that follow from the prediction (ICQ 2009/2010 Comet Handbook, p. H12) corresponding to the suggestion on MPEC 2004-X73 that the Marsden-group comet C/2004 V9 was a return of C/1999 J6, except that this prediction gives T = 2010 May 1.5 TT. The orbital linkage of comets C/2004 V9 and C/2010 H3 (using C2 observations only) gives a passage within 1.2 AU of Jupiter in June 2008, and extrapolation back a further revolution yields T = 1999 May 23.3 (compared to the observed date of 1999 May 11.6). Given also that a fainter second fragment, C/2004 V10, was at perihelion 0.11 day earlier than C/2004 V9, the possibility remains that further fragments will be recorded over the course of the next two weeks (i.e., closer to the time of the Comet Handbook prediction). The object passed 0.014 AU from the moon on 1999 June 12.09, 0.013 AU from the earth on 1999 June 12.19 and 1.16 AU from Jupiter on 2008 June 24. A moderately close approach to the earth to 0.32 AU occurs on 2010 May 29. The expected magnitude is very uncertain, but might be around 20th magnitude. The predicted positions should be good to about 1', and astrometry and photometry would be very desirable. Michale Knight notes that the lightcurves of the three objects are so similar, and brighter than any other Marsden group objects that they are probably returns of the same object. For further information on the discovery of these objects see this year's SOHO discoveries. were discovered with the SOHO LASCO coronographs and have not been observed elsewhere. They were sungrazing comets of the Kreutz group and were not expected to survive perihelion. Some of these comets show no tail at all and it is possible that some supposed observations of Vulcan were actually tiny Kreutz group comets. Details of the SOHO Kreutz comets discovered or announced this year are listed here, with an abbreviated list here. The "Dictionary of Minor Planet Names" notes that (596) Scheila was discovered on 1906 February 21 by A. Kopff at Heidelberg. Named in honor of an acquaintance of the discoverer, a female English student in Heidelberg. (596) Scheila is a main-belt asteroid inclined roughly 14 degree on the ecliptic and it is now 3.1AU from the Sun and 2.5AU from the Earth. It is next at perihelion in 2012 May and has a period of 5.0 years. Its distance from the sun varies between 2.4 and 3.4 AU. It is about 117km diameter and has an abledo of 0.036. Maik Meyer, Limburg, Germany, has discovered a 19th magnitude comet on images obtained by the NEAT project on three nights at Palomar and on five nights at Haleakala during August - December 2001. The August 18.47 Palomar discovery-night images show a 21" tail in p.a. 256 deg, and there was a 0'.2 tail in p.a. 264 deg on the August 22 Haleakala frames. The August 18 observations were reported (though not as being cometary) by NEAT at the time (mag 18.6-18.7), but the object was never followed up; likewise for four LONEOS observations (mag 17.9) on October 24. The comet was at perihelion in 2001 June and has a period of around 6.2 years. Searches of relevant frames by Meyer and others have so far failed to show the comet at its return in 2007. [IAUC 9129, 2010 March 19]. Maik describes further details of the discovery on his web page. Rik Hill discovered an 18th magnitude comet on January 6.46 during the Catalina Sky Survey with the 0.68m Schmidt. Confirming images were taken by Peter Birtwhistle amongst others. The comet has a period of around 9 years, and was at perihelion at 1.9 au in 2009 August. Brian Marsden noted on MPEC 2010-F69 [2010 March 23] that further [astrometric] observations of this comet are desirable. An apparently asteroidal object of 20th magnitude discovered by LINEAR with the 1.0-m reflector on January 6.27 was found to show a cometary appearance by other astrometrists, notably Peter Birtwhistle, but whilst it has a tail, there is no distinctive central condensation. The comet has an exceedingly short period of 3.5 years and was at perihelion at 2.0 AU in 2009 December. The orbit is typical of a main belt asteroid and it may be a small (less than 500 metres) carbonaceous type object. On January 14 we obtained images of this object using the Nordic Optical Telescope in La Palma, and on Jan 15 we made the following report to the CBAT:"J. Licandro (Instituto de Astrof�sica de Canarias, Spain), G. P. Tozzi (INAF, O. di Arcetri), and Tiina Liimets (Nordic Optical Telescope, NOT, Spain & Tartu Obs., Estonia) report the presence of an object, probably an asteroid, 2 arcsec to the East of P/2010 A2 (LINEAR). Six images of 5 minute exposure time each were obtained on Jan. 14 using ALFOSC (Andalucia Faint Object Spectrograph and Camera) on the 2.6m NOT telescope at the "Roque de los Muchachos" Observatory (La Palma, Canary Islands, Spain). Four images were obtained in the R band and two in the V band, starting 22:41 ending 23:39 UT, in non-photometric but very good seeing (0.6 arcsec) conditions. The asteroid moves in the same direction and at the same rate as the comet. In adition, the P/2010 A2 (LINEAR) image does not show any central condensation and looks like a "dust swarm". It is 4 arcmin long and only about 5 arcsec wide (177.000 and 3700 km respectively at the comet distance) with a PA=277 degrees. These observations suggest a connection between the asteroid and the dust swarm. A short lived event, such as a collision, may have produced the observed dust ejecta.". Next night, Jan. 16, the object was observed with the 10.4m GTC telescope and we made the following report "J. Licandro (Instituto de Astrof�sica de Canarias, IAC, Spain), A. Cabrera-Lavers and G. G�mez (IAC & GTC Project Office, Spain) confirms the detection of an object, probably an asteroid, abut 2 arcsec to the East of P/2010 A2 (LINEAR), reported on Jan. 15 by Licandro et al. , on a series of 30s images obtained with the OSIRIS instrument on the 10.4m Gran Telescopio Canarias (GTC) at the "Roque de los Muchachos" Observatory (La Palma, Canary Islands, Spain), on Jan 16, starting 1:41 and ending 3:11 UT. A total of 54 images 30s exp. time each were obtained, 24 with the r, 18 with the i and 12 with the g sloan filters respectively. The object is visible in all images." A few images were taken of P/2010 A2 by Darryl Sergison using the 2.0-m Faulkes Telescope North on January 15 and these showed no evidence of condensations within the elongated coma however the seeing was not particularly good at the time. Another attempt stacking a dozen or so images when subarcsecond seeing is present will be necessary. The Hubble Space Telescope took a spectacular image of the object on January 29. Z. Sekanina, Jet Propulsion Laboratory, writes that the orientations of the tail of this comet reported from the observations made between January 7 and 16 (IAUC 9105, 9109; CBET 2134) suggest its formation between January and August 2009. Because of the edge-on projection (with the earth only 2 to 3 degrees below the comet's orbital plane) it is not possible to decide whether the tail is a product of one or more brief emission events or continuous activity over a period of time. From the tail's length, the maximum solar radiation pressure acceleration exerted on the dust is estimated at about 0.1 percent of the solar gravitational acceleration, which implies that the smallest dust particles in the tail are about 1 mm in diameter (at an assumed density of 1 g/cm^3). David Jewitt et al have a paper on the object, which is to appear in the Astronomical Journal. They conclude that it was an asteroid, which suffered a collision, and that such events should be relatively common, though generally below the detetection threshold of surveys such as LINEAR. On 2013 June 3 the WIYN Observatory put out a press release describing how they had observed a tail of at least 15' using their new One Degree Imager (which currently does 30'). This apparent length corresponds to a real length of about 1 million km. Rik Hill discovered a 17th magnitude comet on January 8.10 during the Catalina Sky Survey with the 0.68m Schmidt. The comet will reach perihelion at 1.6 AU in April 2010 and has a period of around 15 years. Computations by Kenji Muraoka and Hirohisa Sato had quickly suggested that it was a short period object, though the preliminary orbit was parabolic. An object was discovered during the Siding Spring Survey with the 0.5-m Uppsala Schmidt telescope on January 12.72, and was initially reported as asteroidal by Gordon Garradd. After posting on the NEOCP he noted a possibly cometary appearance, as did several other astrometrists. The comet reached perihelion at 2.7 AU in October. The "original" and "future" barycentric values of 1/a are +0.003716 and +0.003785 (+/- 0.000022) AU^-1, respectively. The large "original" value suggests that this comet has made a previous visit to the inner solar system. An apparently asteroidal object of 20th magnitude discovered by LINEAR with the 1.0-m reflector on January 14.45 was found to show a cometary appearance by other astrometrists, including Rolando Ligustri, Ernesto Guido and Giovanni Sostero. The comet has a period of 11.5 years, with perihelion at 1.7 AU in April. This unusual asteroid was discovered at the Steward Observatory, Kitt Peak with the 0.9m reflector on January 6.29. It has a period of 5.5 years and perihelion was at 1.14 AU in October 2009. [MPEC 2010-A27, 2010 January 7, 1-day orbit]. In the current orbit it can approach to around 0.3 AU of Jupiter and 0.15 AU of the Earth. It has a Tisserand criterion value of 2.87. This type of orbit is typical of Jupiter family comets. This unusual asteroid was discovered from Mt Lemmon with the 1.5m reflector on January 8.21. It has a period of 5.1 years and perihelion is at 1.09 AU in late January 2010. [MPEC 2010-A42, 2010 January 9, 1-day orbit]. In the current orbit it can approach to around 0.4 AU of Jupiter and 0.11 AU of the Earth and will get about as close as it can later in the month. It has a Tisserand criterion value of 2.93. This type of orbit is typical of Jupiter family comets. An apparently asteroidal object of 18th magnitude found by Canadian astronomer Rob Cardinal of the Rothney Astrophysical Observatory, with the University of Calgary 0.50-m f/1.0 reflector at Priddis, Canada on January 19.22 was found to show cometary characteristics by other observers after posting on the NEOCP. The comet was at perihelion at 2.9 AU in 2011 February. Visual observations suggested that it was around 14th magnitude during January and February 2011. The "original" and "future" barycentric values of 1/a are +0.000754 and +0.000419 (+/- 0.000025) AU^-1, respectively. The moderate "original" value suggests that this comet has made a previous visit to the inner solar system. A comet was discovered in images from the the Wide-field Infrared Survey Explorer (WISE) satellite on January 22.64. The object showed a hazy coma and tail in all the infra-red images. It was confirmed by ground-based observations from Mauna Kea and Kitt Peak. The comet has a period of 5.5 years and was at perihelion at 1.6 AU in 2009 December. Brian Marsden notes on MPEC 2010-F69 [2010 March 23] that further [astrometric] observations of this comet are desirable. The comet is one of those suspected to have undergone nuclear splitting according to the list of Marcos & Marcos [Dynamically correlated minor bodies in the outer solar system, MNRAS, 474, 838, 2018 February]. They note that it appears to be related to the multiple fragments of 332P/Ikeya-Murakami. This unusual asteroid was discovered in images from the the Wide-field Infrared Survey Explorer (WISE) satellite on January 30. It has a retrograde orbit with a period of around 5000 years and perihelion was at 6.1 AU in April 2012. [MPEC 2010-S36, 2010 September 22]. The orbit has a Tisserand criterion value of 2.45 and has not approached closely to Jupiter or Saturn. It is classed as a scattered disk object. Unless it shows cometary activity it will remain at around 19th magnitude, so in range of amateur CCD observations. Jim Scotti discovered a 20th magnitude comet during Spacewatch observations with the 0.9-m f/3 reflector at Kitt Peak on February 9.21. It was then located on Mount Lemmon images from 2008/9 winter, and in other recent Spacewatch images. The comet has a period of 19 years with perihelion at 5.2 AU in 2009 December. In August, images from WISE taken in early February were linked by Gareth Williams to P/1999 XB69 (LINEAR). This then allowed images from the Mt Lemmon Survey taken at the end of 2008 October to be included in the orbital solution. The indicated correction to the prediction on MPC 56804 is Delta(T) = -0.34 day. The comet has a period of 9.5 years and was at perihelion in 2009 July. This was a non-group comet discovered in C2 images by Zhijian Xu on 2010 February 13. This was a non-group comet discovered in C2 images by Masanori Uchina on 2010 February 15. This was a non-group comet discovered in C2 images by Masanori Uchina and Michal Kusiak on 2010 February 15. 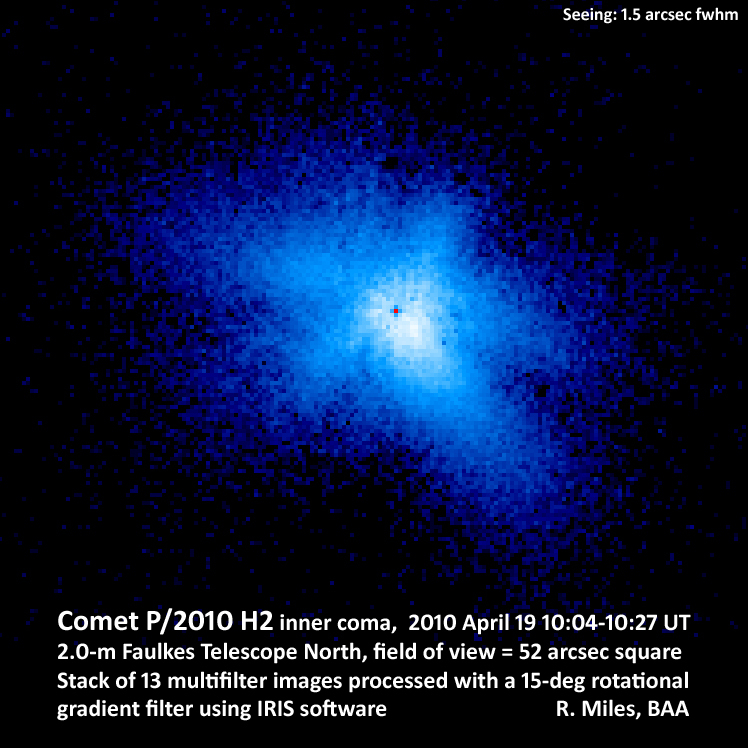 Comets 2010 C7 and 2010 C8 are related. This unusual asteroid was discovered from Mt Lemmon with the 1.5m reflector on February 15.28. It has a period of 4.8 years and perihelion is at 1.01 AU in late January 2010. [MPEC 2010-C75, 2010 February 15, 0.07-day orbit]. In the current orbit it can approach to around 0.4 AU of Jupiter and 0.02 AU of the Earth and was about as close as it can get at discovery. It has a Tisserand criterion value of 2.96. This type of orbit is typical of Jupiter family comets. This unusual asteroid was discovered during the Catalina Sky Survey with the 0.68m Schmidt on February 15.36. It has a retrograde orbit with a period of around 180 years and perihelion is at 2.9 AU in October 2010. [MPEC 2010-T90, 2010 October 12, 9-month orbit]. The orbit has a Tisserand criterion value of -1.55. This unusual asteroid was discovered in images from the the Wide-field Infrared Survey Explorer (WISE) satellite on February 14.35. It has a highly inclined orbit with a period of around 13 years and perihelion was at 3.1 AU in November 2008. [MPEC 2010-D71, 2010 February 22, 6-day orbit]. The orbit has a Tisserand criterion value of 1.43. This unusual asteroid was discovered from Mt Lemmon with the 1.5m reflector on February 14. It has a period of around 130 years and perihelion is at 1.88 AU in September 2010. [MPEC 2010-J10, 2010 May 3]. Aphelion is just under 50 AU. The orbit has a Tisserand criterion value of 1.87. A comet was discovered in images from the the Wide-field Infrared Survey Explorer (WISE) satellite on February 17.34. The object showed a hazy coma and tail though the nuclear condensation was less pronounced than that of P/2010 B2. It was confirmed by Spacewatch observations on February 19.2. Additional images were then found in Catalina observations made on 2009 November 9 and December 10. The comet has a period of 8.5 years and was at perihelion at 2.7 AU in 2009 June. Brian Marsden notes on MPEC 2010-H19 [2010 April 19] that further [astrometric] observations of this comet are very desirable. A comet was discovered in images from the the Wide-field Infrared Survey Explorer (WISE) satellite on February 25.69. The object showed a hazy coma and tail. Peter Birtwhistle made confirming observations on March 4.83, giving it a magnitude of 19.5. The comet was at perihelion at 3.7 AU in March. Brian Marsden notes on MPEC 2010-H19 [2010 April 19] that further [astrometric] observations of this comet are very desirable. Calculations by Hirohisa Sato suggested an elliptical orbit with a period of around 17 years and this is confirmed by the latest MPEC. A comet was discovered in images from the the Wide-field Infrared Survey Explorer (WISE) satellite on February 26.52. The object showed a hazy coma. The comet will reach perihelion at 4.2 AU in September. The small "original" value shows that this comet is on its first visit to the inner solar system from the Oort cloud. A comet was discovered in images from the the Wide-field Infrared Survey Explorer (WISE) satellite on February 28.02. The object showed a "blurry" central condensation in 12-micron images, however ground-based observers have not detected any cometary activity. The comet was at perihelion at 7.1 AU in 2009 March and moves in a long period ellipse of around 600 years. Brian Marsden notes on MPEC 2010-H19 [2010 April 19] that further [astrometric] observations of this comet are desirable. This was a non-group comet discovered in C2 images by Masanori Uchina on 2010 February 19. This unusual asteroid was discovered in images from the the Wide-field Infrared Survey Explorer (WISE) satellite on February 18.00. It has a retrograde orbit with a period of around 500 years and perihelion was at 1.6 AU in mid May. [MPEC 2010-D79, 2010 February 25]. It has a Tisserand criterion value of 1.69. This type of orbit is typical of Halley family comets, so it may show activity nearer perihelion. This suggestion was shown to be correct, and on March 10 it was given a cometary designation following further observations from Mauna Kea made on March 5. The comet was poorly placed at perihelion and will remain very faint. Gordon Garradd discovered a 17th mag comet during the Siding Spring Survey with the 0.5-m Uppsala Schmidt telescope on March 11.57. The comet was at perihelion at 2.7 AU in 2009 November. It has a period of over 1000 years. The "original" and "future" barycentric values of 1/a are +0.009378 and +0.009091 (+/- 0.000047) AU^-1, respectively. The large "original" value confirms that this comet has made a previous visit to the inner solar system. An apparently asteroidal object of 19th magnitude was discovered at the Jarnac Observatory in Vail, AZ, U.S.A., on March 9.31, with follow-up images on March 10 and 12, by the team of D. Levy, W. Levy, and T. Glinos. It was linked with observations from the Mount Lemmon made on February 17, before being posted on the NEOCP. Other astrometrists then showed that it had cometary characteristics. It was approaching perihelion in early April at 2.4 AU and has a period of around 25 years. An object reported as asteroidal in images from the the Wide-field Infrared Survey Explorer (WISE) satellite on March 5.10, but placed on the NEOCP was found to be diffuse with a faint tail in images taken with the Magdalena Ridge Observatory 2.4-m f/8.9 reflector. Further checking of the WISE images showed that the object had a small coma. The comet was near perihelion at 2.3 AU and has a slightly retrograde orbit. Brian Marsden notes on MPEC 2010-H51 [2010 April 24] that further [astrometric] observations of this comet are desirable. Jim Scotti discovered a 20th magnitude comet on CCD mosaic images obtained with the 0.9-m f/3 Spacewatch reflector at Kitt Peak on March 14.23. It was confirmed by many astrometrists after posting on the NEOCP. The comet was at perihelion at 3.9 AU in 2009 November and has a period of around 125 years. A comet discovered at Mt Lemmon in 2017 was linked to an asteroid discovered at Mt Lemmon in 2010. This unusual asteroid was discovered during the Catalina Sky Survey with the 0.68m Schmidt on March 15.45. It has a period of around 5.0 years and perihelion was at 1.01 AU in mid February. [MPEC 2010-F07, 2010 March 16, 1-day orbit]. In the current orbit it can approach to around 0.3 AU of Jupiter and 0.03 AU of the Earth. The orbit has a Tisserand criterion value of 2.91. This unusual asteroid was discovered during the Catalina Sky Survey with the 0.68m Schmidt on March 12.38. It has a retrograde orbit with a period of around 19 years and perihelion is at 1.5 AU in late April. [MPEC 2010-F12, 2010 March 17, 5-day orbit]. In the current orbit it can approach to around 0.9 AU of Jupiter and 0.8 AU of Saturn. The orbit has a Tisserand criterion value of -0.58. Aphelion is at 12.8 AU. No cometary activity has yet been detected. Andrea Boattini discovered an 18th magnitude comet on March 17.20 during the Catalina Sky Survey with the 0.68m Schmidt. The comet was at perihelion at 3.6 AU in 2009 November and has an elliptical orbit with a period of around 600 years. The "original" and "future" barycentric values of 1/a are +0.014902 and +0.014613 (+/- 0.000000) AU^-1, respectively. Jim Scotti discovered a 20th magnitude comet on CCD images obtained with the 0.9-m f/3 Spacewatch reflector at Kitt Peak on March 20.19. It was confirmed by many astrometrists, including Peter Birtwhistle, after posting on the NEOCP. The comet reaches perihelion at 5.4 AU in 2010 August and has a period of around 500 years. The "original" and "future" barycentric values of 1/a are +0.015850 and +0.015937 (+/- 0.000001) AU^-1, respectively. Don Machholz made a visual discovery of an 11th magnitude comet on March 23.53 using a 0.47-m f/4.8 reflector (77x) at his home in Colfax, CA, U.S.A. Machholz had searched for 607 hours since his previous find on 2004 Aug. 27. The comet is moving rapidly towards perihelion and is already poorly placed for observation. The comet was at perihelion at 0.6 AU in early April, when the comet was at 1.4 AU from the Earth. Observing circumstances do not improve a great deal. Don provides discovery details on his webpage. An apparently asteroidal object discovered by WISE on March 28.22 was briefly on the NEOCP before being given an asteroidal designation. An independent discovery of an object showing a possible faint tail was made by Gordon Garradd on April 21.67 and placed on the NEOCP where it was confirmed by S. Foglia, P. Miller, and J. Wood from a 30-s CCD exposure by Wood with the 2.0-m 'Faulkes Telescope South'. The comet reached perihelion at 2.8 AU in November, and has a period of over 5000 years. The "original" and "future" barycentric values of 1/a are +0.004320 and +0.004449 (+/- 0.000040) AU^-1, respectively. This unusual asteroid was discovered from Mt Lemmon with the 1.5m reflector on March 16.34. It has a period of 4.8 years and perihelion was at 1.05 AU in late March 2010. [MPEC 2010-F10, 2010 March 17, 0.6-day orbit]. In the current orbit it can approach to around 0.3AU of Jupiter and 0.06 AU of the Earth and was about this close in the second half of March. It has a Tisserand criterion value of 2.97. This type of orbit is typical of Jupiter family comets. This unusual asteroid was discovered in images from the the Wide-field Infrared Survey Explorer (WISE) satellite on March 28.11. It has a period of around 18 years and perihelion is at 1.1 AU in mid May. Aphelion is at 12.8 AU. [MPEC 2010-G05, 2010 April 3, 6-day orbit]. The orbit has a Tisserand criterion value of 1.90 and can approach within 0.2 AU of both Jupiter and the Earth. This type of orbit is typical of Jupiter family comets. This unusual asteroid was discovered in images from the the Wide-field Infrared Survey Explorer (WISE) satellite on March 17.24. It has a period of 120 years and perihelion was at 5.8 AU in 2010 March. Aphelion is at 43 AU. [MPEC 2010-G101, 2010 April 13; MPEC 2012-H67, 2012 April 25]. The orbit has a Tisserand criterion value of 1.53. Andrea Boattini discovered a 14th magnitude comet on April 5.12 during the Catalina Sky Survey with the 0.68m Schmidt. The comet was at perihelion at 1.2 AU at discovery and is now too faint for visual observation. The "original" and "future" barycentric values of 1/a are +0.002877 and +0.002232 (+/- 0.000138) AU^-1, respectively. Brian Marsden notes on MPEC 2010-L68 [2010 June 14] that further [astrometric] observations of this comet are desirable. Rik Hill discovered a 19th magnitude comet on April 10.43 during the Catalina Sky Survey with the 0.68m Schmidt. The comet was over 5 AU from the Sun at discovery. Perihelion was at 2.0 AU in September 2011 and it has a period of around 1000 years. The comet was picked up as it brightened through 14th magnitude in March 2011 and reached 10th magnitude at its brightest in the autumn. The comet may have undergone one or more minor outbursts, but the effect of these is not yet clear in the overall light curve. The "original" and "future" barycentric values of 1/a are +0.011116 and +0.010947 (+/- 0.000029) AU^-1, respectively. The very large "original" value shows that this comet has made a previous visit to the inner solar system. A comet was discovered in images from the the Wide-field Infrared Survey Explorer (WISE) satellite on April 14.14. The 19th magnitude object showed a coma and tail, and was the brightest seen so far in the 22 micron band. The comet was at perihelion at 4.9 AU in April. The "original" and "future" barycentric values of 1/a are +0.000613 and +0.000922 (+/- 0.000058) AU^-1, respectively. This unusual asteroid was discovered in images from the the Wide-field Infrared Survey Explorer (WISE) satellite on April 5.00. It has a period of around 5.2 years and perihelion was at 0.9 AU in mid February. [MPEC 2010-G59, 2010 April 9, 5-day orbit]. It has a Tisserand criterion value of 2.60 and can approach within 0.4 AU of Jupiter and 0.10 AU from the Earth. This type of orbit is typical of Jupiter family comets. This unusual asteroid was discovered from Mt Lemmon with the 1.5m reflector on April 10.21. It has a period of 5.2 years and perihelion was at 1.24 AU in mid March 2010. [MPEC 2010-G83, 2010 April 11, 1-day orbit]. In the current orbit it can approach to within 0.5 AU of Jupiter and 0.26 AU of the Earth. It has a Tisserand criterion value of 2.85. This type of orbit is typical of Jupiter family comets. This unusual asteroid was discovered in images from the the Wide-field Infrared Survey Explorer (WISE) satellite on April 6.78. It has a retrograde orbit with a period of around 900 years. Perihelion was at 3.7 AU in mid April and aphelion is around 190 AU. [MPEC 2010-G109, 2010 April 14, 7-day orbit]. The orbit has a Tisserand criterion value of -0.57. This type of orbit is typical of Halley family comets. This unusual asteroid was discovered in images from the the Wide-field Infrared Survey Explorer (WISE) satellite on April 12.68. It has a moderately inclined orbit with a period of around 9.6 years. Perihelion was at 0.3 AU in mid February. [MPEC 2010-H08, 2010 April 17, 5-day orbit]. The orbit has a Tisserand criterion value of 1.59. This unusual asteroid was discovered in images from the the Wide-field Infrared Survey Explorer (WISE) satellite on April 14.20. It has a retrograde orbit with a period of around 76 years. Perihelion was at 5.5 AU in March and aphelion is around 30 AU. [MPEC 2010-H33, 2010 April 20, 5-day orbit]. The orbit has a Tisserand criterion value of -0.17. The object can pass 2 AU from Saturn. This type of orbit is typical of Halley family comets. Gordon Garradd discovered a 19th mag comet during the Siding Spring Survey with the 0.5-m Uppsala Schmidt telescope on April 16.65. The comet was at perihelion at 2.7 AU in mid June. The "original" and "future" barycentric values of 1/a are +0.000018 and +0.000563 (+/- 0.000036) AU^-1, respectively. On 2010 April 16.0, Jan Vales of the Crni Vrh observatory, Slovenia, discovered a 13th magnitude 'star' moving slowly across the sky. Observations using larger telescopes some hours later showed the object was slightly more diffuse than the adjacent stars and it was subsequently identified as a new comet, one that seems to have undergone an outburst of 7 magnitudes or more within a time interval of less than 14 hr. This unusual comet, P/2010 H2 was observed on April 19.4 with the 2.0-m Faulkes Telescope North by myself using six different filters in all. At this time, the comet has a very bright slightly elliptical central region some 3.3"x3.9" in size (fwhm) and the outer coma extends some 35"x40" tilted at a position angle of 70/250 deg. A set of 13 images were tracked and stacked using Astrometrica software and then subjected to rotational gradient processing using IRIS software to bring out the faint details within the inner coma as shown in the accompanying image. The orbit of the object shows that the parent body is one of the family of asteroids known as the Hildas, which are held in their orbit through resonance with the planet Jupiter. We may have witnessed an event whereby the asteroid in question has collided with a smaller body causing it to disintegrate into fragments, releasing dust and gas in the process. On the other hand, some internal process may have triggered what is essentially a cometary outburst - we just do not know at this stage! We already know of almost 20 Hilda-type comets and P/2010 H2 appears to be the newest member to join this group. In the latest image, outflowing jets of dust can be seen emanating in at least 5 different directions. However, the majority of material reflecting sunlight still remains within less than 5 arcseconds of the nucleus almost 4 days after the initial outburst, which means that most of the mass of the parent body is moving away in all directions at less than 30 m/s, i.e. something of a snail's pace for such a relatively massive outburst. Further observations to follow the evolution of this new comet, which reaches perihelion around May 21, will help to understand its true nature. Jim Scotti discovered a 21st magnitude comet on CCD mosaic images obtained with the 0.9-m f/3 Spacewatch reflector at Kitt Peak on April 20.27. The comet is at perihelion at 4.8 AU in June and has a period of around 17 years. Brian Marsden notes on MPEC 2010-M43 [2010 June 22] that further [astrometric] observations of this comet are very desirable. Jim Scotti discovered a 21st magnitude object with a slightly cometary appearance on images obtained with the 0.9-m f/3 Spacewatch reflector at Kitt Peak on April 21.15. It was confirmed as cometary following further images with the 1.8-m Spacewatch reflector and the Magdalena Ridge 2.4-m reflector in early May. The comet has a period of 19 years and was at perihelion at 6.0 AU in April. Andrea Boattini discovered a 16th magnitude comet on May 6.38 during the Catalina Sky Survey with the 0.68m Schmidt. The comet was at perihelion at 1.7 AU in early February and was discovered when near its brightest. It has a period of over 200 years. The "original" and "future" barycentric values of 1/a are +0.027310 and +0.027684 (+/- 0.000005) AU^-1, respectively. The large "original" value shows that this comet has made a previous visit to the inner solar system. Rob McNaught discovered a 17th mag comet during the Siding Spring Survey with the 0.5-m Uppsala Schmidt telescope on May 8.75. The comet was a month from perihelion at 3.4 AU at discovery. The "original" and "future" barycentric values of 1/a are +0.000577 and +0.000568 (+/- 0.000044) AU^-1, respectively. A Spacewatch object discovered with the 0.9-m f/3 reflector at Kitt Peak on May 12.21 and posted on the NEOCP was quickly noted as cometary by John Cave and Richard Miles on images taken with the Faulkes telescope. It was confirmed the next day in an IAUC. The comet reaches perihelion at 2.5 AU in August. Calculations by Hirohisa Sato suggested that a rather better fit to the observations was given by a periodic orbit of around 25 years. Further observations linked the comet with asteroid 2010 CG6, observed by WISE in February and refined the period to 27 years. A comet was discovered in images from the the Wide-field Infrared Survey Explorer (WISE) satellite on May 12.24. The 19th magnitude object showed a coma and tail, and was the brightest discovered so far by WISE. The comet was near perihelion at 1.1 AU. Brian Marsden notes on MPEC 2010-N57 [2010 July 13] that further [astrometric] observations of this comet are desirable. Rob McNaught discovered a 19th mag comet during the Siding Spring Survey with the 0.5-m Uppsala Schmidt telescope on May 12.70. The initial orbit promised a visual object, however this soon changed into a periodic orbit. The comet was at perihelion at 3.7 AU in 2009 November and has a period of 8.3 years. The orbital eccentricity is small, with a value of 0.09. This unusual asteroid was discovered in images from the the Wide-field Infrared Survey Explorer (WISE) satellite on May 10. It has an inclined orbit with a period of around 23 years. Perihelion was at 1.8 AU in 2011 April. [MPEC 2010-V52, 2010 November 5, 6-month orbit]. The orbit has a Tisserand criterion value of 2.21. Aphelion is at 14.5 AU. A visual observation put it at 13.5 in 2011 September. Observations by G. V. Borisov and V. Rumyantsev with the Crimean Astrophysical Observatory 2.6-m reflector and 0.2-m astrograph in early August 2011 showed that the object had brightened to 15th magnitude and showed cometary features. This unusual asteroid was discovered in images from the the Wide-field Infrared Survey Explorer (WISE) satellite on May 12.37. It has an inclined orbit with a period of around 600 years. Perihelion was at 2.6 AU in 2011 March and aphelion is at around 140 AU. [MPEC 2010-K24, 2010 May 20, MPEC 2011-Q15, 2011 August 23]. The orbit has a Tisserand criterion value of 1.26. Although 4 AU from the sun at discovery, the object did not show cometary activity as it neared perihelion. This unusual asteroid was discovered in images from the the Wide-field Infrared Survey Explorer (WISE) satellite on May 15.67. It has an inclined orbit with a period of around 45 years. Perihelion was at 3.4 AU in 2010 April. [MPEC 2010-K28, 2010 May 20, 5-day orbit]. The orbit has a Tisserand criterion value of 1.99. Aphelion is at 22 AU. Jim Scotti recovered comet 2003 UY275 on May 20.44 with the Spacewatch 1.8-m f/2.7 reflector at Kitt Peak. The indicated correction to the orbit on MPC 59600 is Delta(T) = -0.70 day. An object noted in images from the the Wide-field Infrared Survey Explorer (WISE) satellite on May 27.18 and posted on the NEOCP has been found to show cometary characteristics Jim Scotti with the Spacewatch 1.8-m reflector and Alan C. Gilmore and Pamela M. Kilmartin with the Mount John 1.0-m reflector. Further inspection of the WISE images also showed a coma and tail. The comet is at perihelion at 1.2 AU in July and has a period of 5.0 years. Brian Marsden notes on MPEC 2010-N57 [2010 July 13] that further [astrometric] observations of this comet are very desirable. This unusual asteroid was discovered in images from the the Wide-field Infrared Survey Explorer (WISE) satellite on May 16.06. It has a retrograde orbit with a period of around 130 years. Perihelion was at 2.6 AU in 2010 October. [MPEC 2010-K29, 2010 May 20]. The orbit has a Tisserand criterion value of 2.10. Aphelion is at 49 AU. The object may show cometary activity as it nears perihelion. As predicted, the object did show slight cometary activity near perihelion. Observations in mid October and early November showed a slight coma and short tail. A comet was discovered in images from the the Wide-field Infrared Survey Explorer (WISE) satellite on June 2.50. The comet showed a coma and tail, and was around magnitude 20 when confirmed with ground based images. Richard Miles made confirming observations with the Faulkes Telescope North. The comet was at perihelion at 2.1 AU in February and has a period of 8.1 years. Rob Matson has identified the comet on NEAT images from Palomar taken in August and September 2002, which have been given the identity 2002 Q16. A cometary object discovered by WISE on June 10.57 was quickly linked by the WISE team to an asteroidal object found by LINEAR on 2002 June 6.23. The comet has a period of 7.2 years and was at perihelion at 2.4 AU in 2009 December. An apparently asteroidal object of 20th magnitude discovered by the Catalina Sky Survey on June 15.30 and placed on the NEOCP was found to show a small coma by other observers, including Peter Birtwhistle (imaging from the UK). The comet reaches perihelion at 9.9 AU in 2010 November. The "original" and "future" barycentric values of 1/a are +0.000122 and +0.000050 (+/- 0.000008) AU^-1, respectively. The small "original" value shows that this comet is probably on its first visit to the inner solar system from the Oort cloud. A comet was discovered in images from the the Wide-field Infrared Survey Explorer (WISE) satellite on June 15.46. The object showed a "hazy" coma and tail in 12 and 22 micron images. It was confirmed by ground based observers including Peter Birtwhistle and Richard Miles, who estimate it at around 20th magnitude. The comet was at perihelion at 2.8 AU in February and has a long period orbit of around 700 years. The "original" and "future" barycentric values of 1/a are +0.012771 and +0.012812 (+/- 0.000004) AU^-1, respectively. A relatively bright (for WISE) comet was discovered in images from the the Wide-field Infrared Survey Explorer (WISE) satellite on June 14.29. The object showed a coma and tail in all wavebands. It was confirmed by ground based observers over the next week, who estimated it at around 18th magnitude. The comet was at perihelion at 0.8 AU in late April, with a period of around 30 years. It has a faint absolute magnitude. Brian Marsden notes on MPEC 2010-O21 [2010 July 23] that further [astrometric] observations of this comet are extremely desirable. This unusual asteroid was discovered in images from the the Wide-field Infrared Survey Explorer (WISE) satellite on June 2.63. It has a period of around 9.6 years and perihelion is at 1.6 AU in mid June. [MPEC 2010-L49, 2010 June 9, 7-day orbit]. The orbit has a Tisserand criterion value of 2.49 but there are currently no significant approaches to either Jupiter or Saturn. This unusual asteroid was discovered in images from the the Wide-field Infrared Survey Explorer (WISE) satellite on June 2.69. It has a retrograde orbit with a period of around 20 years and perihelion at 1.4 AU. [MPEC 2010-O48, 2010 July 30, 55-day orbit]. The original orbit, published on MPEC 2010-L63 on June 13 and based on only 1 day of observations was completely wrong, though noted as being indeterminate. Alex Gibbs discovered a 21st magnitude comet during the course of the Mt Lemmon Survey with the 1.5-m reflector on June 22.22. The comet reaches perihelion at 2.2 AU in 2012 February, but is unlikely to become a visual object. Brian Marsden notes on MPEC 2010-T94 [2010 October 13] that further [astrometric] observations of this comet are extremely desirable. A comet was discovered in images from the the Wide-field Infrared Survey Explorer (WISE) satellite on July 5.48. The comet showed a coma and tail. The comet is at perihelion at 1.5 AU in August and has a period of 5.7 years. Jana Pittichova recovered P/2005 U1 on images obtained with the 2.2-m University of Hawaii reflector at Mauna Kea on July 7.43. The comet was around mag 24. The indicated correction to the prediction on MPC 62880 is Delta(T) = -0.2 day. This unusual asteroid was discovered in images from the the Wide-field Infrared Survey Explorer (WISE) satellite on July 2.00. It has a retrograde orbit with a period of around 1000 years and was at perihelion at 9.3 AU in 2009 September. [MPEC 2010-N54, 2010 July 13, 12-day orbit]. It has aphelion at around 200 AU. The orbit has a Tisserand criterion value of -2.80 with respect to Jupiter. This unusual asteroid was discovered in images from the the Wide-field Infrared Survey Explorer (WISE) satellite on July 16.42. In August it was linked to 2010 BY83, also discovered by WISE, enabling an improved orbit to be calculated. It has a retrograde orbit with a period of 142 years and was near perihelion at 2.1 AU. [MPEC 2010-Q40, 2010 August 29]. It can pass within 1 AU of Saturn and has aphelion near 50 AU. The orbit has a Tisserand criterion value of -1.22 with respect to Jupiter. This unusual asteroid was discovered in images from the the Wide-field Infrared Survey Explorer (WISE) satellite on July 17.08. It has a highly inclined orbit with a period of around 9 years and perihelion at 1.4 AU. [MPEC 2010-P07, 2010 August 3, 17-day orbit]. There have been no recent planetary encounters. The orbit has a Tisserand criterion value of 1.32 with respect to Jupiter. This unusual asteroid was discovered in images from the the Wide-field Infrared Survey Explorer (WISE) satellite on July 25.02. It has a period of around 6.6 years and perihelion at 1.4 AU. [MPEC 2010-P11, 2010 August 3, 9-day orbit]. It can pass within 0.1 AU of Jupiter. The orbit has a Tisserand criterion value of 2.71 with respect to Jupiter. This unusual asteroid was discovered in images from the the Wide-field Infrared Survey Explorer (WISE) satellite on July 28.19. It has a retrograde orbit with a period of around 1000 years and reaches perihelion at 2.1 AU in October. [MPEC 2010-P16, 2010 August 4, 7-day orbit]. It has aphelion at around 200 AU. The orbit has a Tisserand criterion value of -0.82 with respect to Jupiter. 2002 X2 (P/NEAT) was independently recovered between August 9 and 11 by H. Taylor (Rayle, GA, U.S.A., 25-cm reflector), by H. Sato (Tokyo, Japan; remotely, 25-cm reflector, RAS Observatory, Mayhill, NM, U.S.A.; 20" coma and 30" tail in p.a. 260 deg), by L. Elenin (Lyubertsy, Russia; remotely, 45-cm f/2.8 astrograph, ISON-NM Observatory, Mayhill; 50" tail), and by T. Yusa (telescope data same as for Sato; faint 25" tail in p.a. 252 deg). The indicated correction to the prediction by S. Nakano (ICQ 2009/ 2010 Comet Handbook, p. 108) is Delta(T) = -0.63 day. [IAUC 9159, 2010 August 12]. Gary Hug recovered comet 1998 U4 (P/Spahr) on August 14.41 on images taken with a 0.56-m reflector located near Scranton, KS, U.S.A. The indicated correction to the prediction by B. G. Marsden on MPC 65938 is Delta(T) = +0.04 day. Amy Mainzer, Jet Propulsion Laboratory, reported that a comet was discovered in images from the the Wide-field Infrared Survey Explorer (WISE) satellite on August 6.59. The comet showed a 150" tail. Following posting on the NEOCP, ground based observers did not note any cometary characteristics in the nearly 22nd magnitude object. The comet was at perihelion at 1.9 AU in July and has a period of 7.1 years. This unusual asteroid was discovered in images from the the Wide-field Infrared Survey Explorer (WISE) satellite on August 5.84. It has a retrograde orbit with a period of around 25 years. Perihelion was at 3.0 AU in 2009 May. Aphelion is at nearly 15 AU. [MPEC 2010-P59, 2010 August 13, 7-day orbit]. The Tisserand parameter with respoect to Jupiter for the orbit is -0.42. An apparently asteroidal object of 21st magnitude discovered by LINEAR on September 4.15 was found to be "fuzzy" with a tail in follow-up observations with the Magdalena Ridge 2.4-m reflector. The comet reaches perihelion at 5.6 AU in 2012 May. The La Sagra team (Spain) discovered another comet on September 14.87 and were able to find pre-discovery observations from August 13.0. The object was confirmed as cometary by Peter Birtwhistle and fellow astrometrists. The comet is around 19th magnitude. It has a period of 5.5 years and was at perihelion at 2.6 AU in late June. The object appears to be another main-belt comet, similar to 133P = (7968) Elst-Pizarro. This unusual asteroid was discovered by LINEAR on 2010 September 10.30 with the 1-0m reflector. It has a period of 5.3 years and perihelion is at 1.16 AU in 2010 October. [MPEC 2010-R97, 2010 September 12, 2-day orbit]. In the current orbit it can approach to around 0.5 AU of Jupiter and 0.17 AU of the Earth. The orbit has a Tisserand criterion value of 2.89. This type of orbit is typical of Jupiter family comets. An apparently asteroidal object of around 18th magnitude discovered by LINEAR on September 21.36 was found to have a bright coma with a tail in follow-up observations. The comet reached perihelion at 5.9 AU in 2013 May. Calculations by Hirohisa Sato had suggested an elliptical orbit with a period of over 4000 years and perihelion at 5.9 AU in 2013 May. Visual observations between 2011 August and 2013 October suggest that it reached a peak of just over 13th magnitude and brightened quite quickly for such a distant comet. It is now beginning to fade. This unusual asteroid was discovered from Mt Lemmon with the 1.5m reflector on September 30.25. It has a period of 5.8 years and perihelion was at 1.08 AU in late September 2010. [MPEC 2010-S70, 2010 September 30, 0.1-day orbit]. In the current orbit it can approach to around 0.2 AU of Jupiter and 0.08 AU of the Earth and was about as close as it can be (passing inside the MOID) just after discovery. It has the very faint absolute magnitude of 25.7. The orbit has a Tisserand criterion value of 2.79. This type of orbit is typical of Jupiter family comets. PANSTARRS discovered its first comet on October 6.43 when Richard Wainscoat noted a 21st magnitude diffuse object amongst those identified by the Pan-STARRS Moving Object Processing System. He then found additional images from the following day and it was confirmed after posting on the NEOCP. The comet has a period of around 13 years and perihelion is at 3.7 AU in 2011 July. The osculation epoch for the orbit is the current standard epoch, rather than the 40-day epoch closest to perihelion, which is normal for comets. Like the recent case of P/2011 P1 (McNaught), P/2010 TO20 (LINEAR-Grauer) has made a recent close approach to Jupiter (0.077 au on 2009 November 2). For current epochs, the perihelion date lies in 2008. For epochs in 2008, the perihelion date lies in 2012-2013. Andrea Boattini discovered a 19th magnitude comet with the Mt. Lemmon 1.5-m reflector on October 17.23. It was confirmed following posting on the NEOCP. The comet was at perihelion in 2010 March at 4.9 AU and has a period of 17 years. Rik Hill discovered an 18th magnitude comet on Catalina 0.68-m Schmidt telescope CCD images on October 17.32. It was confirmed following posting on the NEOCP. The comet is at perihelion in November at 2.6 AU and has a period of 8.8 years. Andrea Boattini discovered a 19th magnitude comet with the Mt. Lemmon 1.5-m reflector on October 31.33. It was confirmed following posting on the NEOCP. The comet is at perihelion in 2019 at 8.5 AU. It was discovered whilst still over 18.5 AU from the Sun. The orbit is still uncertain, and one possibility is that it is a Centaur or SDO on a periodic orbit. In this case, like Chiron, its light curve might be rather erratic. Spacewatch discovered asteroid 2010 UH55 on October 29, and Hirohisa Sato suggested that it showed a coma the following month. This remained unconfirmed until 2011 November, when he again noted a coma. This time follow-up observations confirmed a coma and tail, resulting in the cometary designation. The comet was at perihelion at 2.8 AU in 2011 May and has a period of 16.6 years. A visual comet has been discovered by Japanese amateur observers, Kaoru Ikeya (Mori-machi, Shuchi-gun, Shizuoka-ken; 25-cm reflector at 39x; diffuse with some condensation; coma diameter 1' on November 2.831 UT and 2' on November 3.812) and by Shigeki Murakami (Toukamachi, Niigata-ken; 46-cm reflector at 78x; coma diameter 4' with a 2' tail in p.a. 90 deg on November 3.801; moving eastward at approximately 2'/hr). It is 47 years since the first discovery by Ikeya (1963 A1). The comet was magnitude 8.5 at discovery by Ikeya, and 8 the following day. It seemed to be brightening rapidly, as visual observation by Juan Jose Gonzalez on November 4.2 put it as bright as 7.6 in 10x50B. This may indicate that the comet is undergoing an outburst. This suggestion is partially confirmed by Ikeya's failure to spot the comet when he searched the discovery area on November 1.8. The coma expanded, and the comet had faded to around 12th magnitude by early December, much faster than a standard light curve would suggest. The orbit is elliptic, with the comet at perihelion at 1.6 AU in mid October and a period of around 5.3 years, as first suggested by Hirohisa Sato. Maik Meyer noted that there were similarities with the orbit of P/2010 B2, however once the orbit of 2010 V1 became better known Hirohisa Sato was able to show that the two orbits did not converge when computed back in time. Comet 2004 F3 (P/NEAT) was recovered by E. Romas (Rostov-na-Donu, Russia), A. Novichonok (Kondopoga, Russia), and Dmitry Chestnov (Saransk, Russia) on forty stacked 120-s images obtained on November 2.0 UT with the 0.5-m f/8.3 Maksutov-Cassegrain reflector at the Kislovodsk Mountain Astronomical Station of Pulkovo Observatory. Gary Hug (Scranton, KS, U.S.A.) found the comet to be slightly diffuse on images taken with a 0.56-m reflector on November 3.5. The indicated correction to the prediction on MPC 69908 is Delta(T) = -0.02 day. 2010 V3 = 2002 VP94 (247P/LINEAR) was discovered by LINEAR on 2002 November 5.31 as an asteroid, of 19th magnitude. It is in an 8.0 year orbit, with perihelion at 1.52 AU and an eccentricity of 0.62. It was at perihelion in 2003 January. [MPEC 2002-V70, 2002 November 15, 10-day orbit] Brian Marsden notes that it is not clear if the object is in fact a comet. The orbit is typical of a Jupiter family comet and it can pass within 0.4 AU of the planet. An apparently asteroidal object of 18th magnitude discovered by LINEAR on November 17.34 was found to show cometary features in late December by Hirohisa Sato. The comet has a period of 14 years and was at perihelion at 1.8 AU in October. This was LINEAR's 200th comet. Leonid Elenin discovered a 19th magnitude comet on December 10.42 using the 0.45-m astrograph at the ISON-NM observatory, Mayhill. The comet has a perihelion at around 0.5 AU in September 2011. Hirohisa Sato gave alternative parabolic or hyperbolic orbits which satisfy the astrometry to around the same order, and the latest MPEC now favours the parabolic solution. The comet may come into visual range in April, and Southern Hemisphere observers are favoured in the run-up to perihelion. In the South the comet will be at its best in the first half of September, when it may have a five degree tail, although the full moon will spoil the view and the comet is fairly low down. UK observers will get their best views in early October, when the comet may sport a three degree tail. The comet will pass through the SOHO C3 field between 2011 September 22 and 30 when it could be 6th magnitude. Early orbits were given to high precision, prompting this comment: Orbital elements are often given to 5 dp, when they are probably accurate to less than 2. The accuracy issue can be seen very clearly in successive MPEC orbits for newly discovered comets, where many given to 5dp turn out to be accurate to worse than a degree. 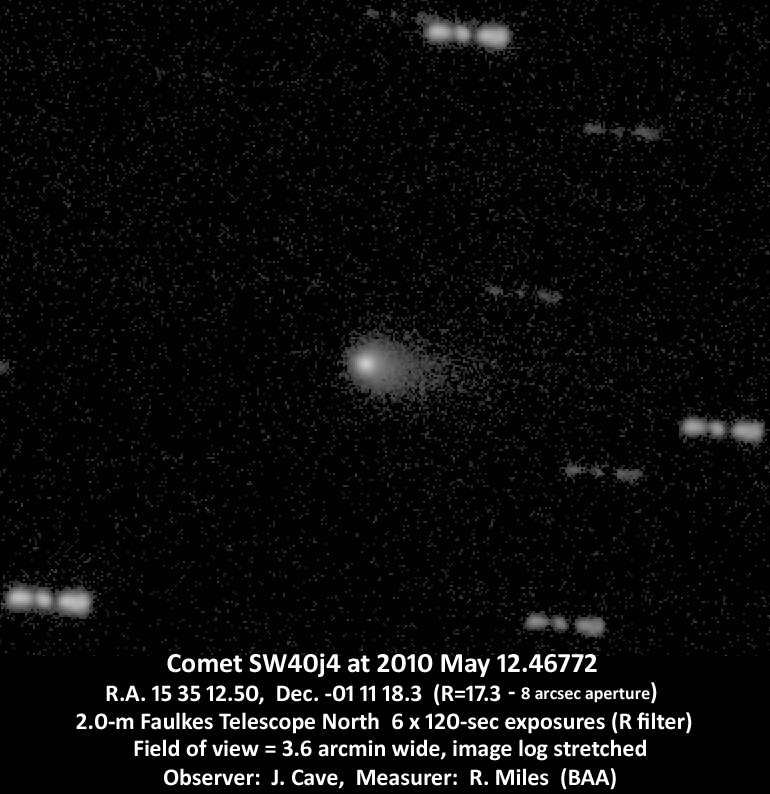 The first visual observations were secured in early April 2011, and suggested that the comet was around 15th magnitude and nearly stellar in appearance. A few supposed authorities suggested that these observations were incorrect, forgetting that each observer has different eyes. Just because one observer can't see an object under a set of conditions doesn't mean that all observers can't see the object. As a UK example George Alcock could see features in cometary tails that very few other observers were capable of recording. Observations in late June suggested that the comet was perhaps 11th magnitude, with some scatter due to observing conditions. Observations in late August suggested that it had ceased to brighten and was becoming more diffuse, evidence that it was in the process of disintegration. CCD observers failed to recover it post perihelion and Internet chat also suggested that the comet could not possibly have survived perihelion. Many "experts" disputed reports of visual observations of a dust cloud, however CCD images taken in good conditions have subsequently proven that these visual observers were correct. In addition the comet was also visible in STEREO images. The recent observations of C/2010 X1 (Elenin) are discordant, presumably due to the lack of any obvious condensation. It is probable that this comet is disintegrating. Whilst Internet chat suggested that the comet would have a significant effect on the Earth, its gravitational pull at its closest was about as significant as that of a mobile phone held to your ear. This unusual asteroid was discovered during the Catalina Sky Survey with the 0.68m Schmidt on December 12.42. It has an orbit with a period of around 4.6 years and perihelion is at 0.3 AU in February 2011. [MPEC 2010-X106, 2010 December 13, 1-day orbit]. The orbit has a Tisserand criterion value of 2.46. The object can approach to within 0.1 AU of Jupiter and 0.3 AU of Earth. This unusual asteroid was discovered from Mt Lemmon with the 1.5m reflector on December 14.13. It has a period of 6.6 years and perihelion is at 1.18 AU in early January 2011. [MPEC 2010-Y17, 2010 December 19, 1-day orbit]. In the current orbit it can approach to around 0.5AU of Jupiter and 0.2 AU of the Earth. The orbit has a Tisserand criterion value of 2.71. This type of orbit is typical of Jupiter family comets.